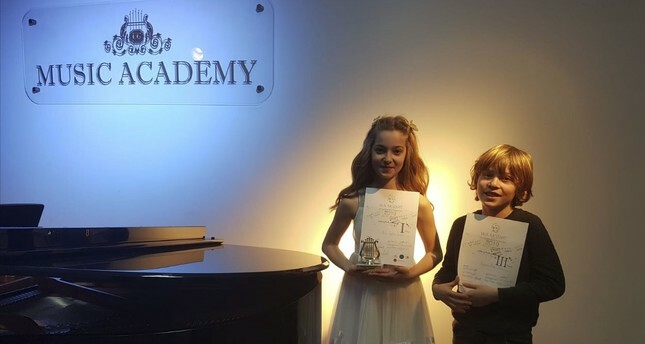 Ten-year-old violinist Nil İpek Şabi won first place at the 4th International Mozart Music Competition while her younger brother Kıvanç Arda Şabi finished in third place on the cello. Nil, a sixth-grade student at the Bilkent University Music Preparatory Primary and Secondary School, had received the Grand Prix in solo violin at a music contest held in Albena, Bulgaria on Oct. 4-11, 2018. Her brother Kıvanç Arda Şabi, who is a fourth-grade student at the same school, came in second in cello in the same contest. With their success, the siblings won the chance to participate in the 4th International Mozart Music Competition. Nil İpek said that her mother, a gym teacher, discovered her talent for rhythm and made her start playing piano at the age of 4 and violin at the age of 5. Then she decided to continue her music journey with the violin. Nil, a scholarship student, said, "I want to be the lead soloist of the orchestra with my violin in the future." She expressed her happiness of coming in first at an international music competition, saying, "Thanks to my hard work, I have obtained a degree at this competition, I am very happy. It is a distinct pleasure for me to achieve success at the same contest as my brother. We expect financial and moral support from our great musicians. We will continue to work for our country." On the same note, 9-year-old Kıvanç Arda continues his education in music with violin and cello lessons. The little cellist stated that he started cello training with Arthur Rahmatullah three years ago. Kıvanç Arda said that his most recent success has motivated him very much. Kıvanç also came in second at the 13th Jan Vychytil International Cello Competition held in Prague, on Jan. 18. He stated that this award doubled his pleasure. This was the third international competition that the young cellist joined. Stressing that he returned home with awards from all the three competitions, Kıvanç Arda said, "I want to be the best cellist in Turkey when I grow up. I am working hard for that." Gamze Şabi, the talented pair's mother, expressed her pride and pleasure on the success of her children. She said that Nil İpek and Kıvanç Arda have lives that are a little different from other children their age. The proud mom said her children do their regular homework after returning from school and then practice playing their instruments until bedtime. Şabi said that Bilkent University and teachers support her children very much but they still need support to participate in competitions. "As a civil servant, we can cover the expenses to a certain point. We are doing our best. The education, training and competition costs for children are expensive. We work as much as we can to cover the costs. However, we need financial support to do more. In this sense, we are looking for sponsors who can help us. We expect support from famous artists such as the Güher-Süher Pekinel sisters, Fazıl Say and Cihat Aşkın."